Bison Adam DeJonckheere goes in for an attack against the Trinity Western University Spartans at the Investors Group Athletic Centre. This weekend the Bison volleyball programs welcomed some top tier competition. The Trinity Western University Spartans have both good men’s and women’s programs, with the women ranked eighth and the men ranked number one in Canada. The women were able to earn a surprising split, while the men were swept, but not without a fight. On Friday night the Bisons managed a 3-1 victory. After falling 25-20 in the first set the Bisons stormed out and won three straight sets to snap their four game losing streak. Kearley Abbott finished with 18 kills and two service aces, with Cassie Bujan coming up with a team best 18 digs. The Saturday rematch started out well for the Bisons, taking the first set 25-19. Manitoba then seemed to fall out of sorts, losing the next two. In the fourth set the Bisons were down by as much as 21-11 but fought back to make the score 24-21, before eventually losing off a net violation. “We just started playing too late in the fourth set,” said head coach Ken Bentley. Josie Abbott finished with 11 kills, and her sister Kearley also finished with 11. Bujan finished with 19 digs, and now leads the country with 281. “We played a real strong match on [Friday] but we’ve got to be able to back up that level of commitment and intensity and kind of stick-to-itness,” Bentley said. The last time the Spartans were in town for the Canada West Final Four last season, the Bisons were a completely different team. When the Bisons and Spartans met in the final it was a clash of the two best teams in the country. This season saw a lot of turn over for head coach Pischke’s squad, but the ninth-ranked Bisons put up a fight against the number one ranked Spartans. On Friday the Bisons fell in four sets, after taking the first set the Spartans took over. It was the veterans getting it done offensively for Manitoba with Scott Vercaigne smacking home 13 kills, with Adam DeJonckheere and Kevin Negus collecting 11. 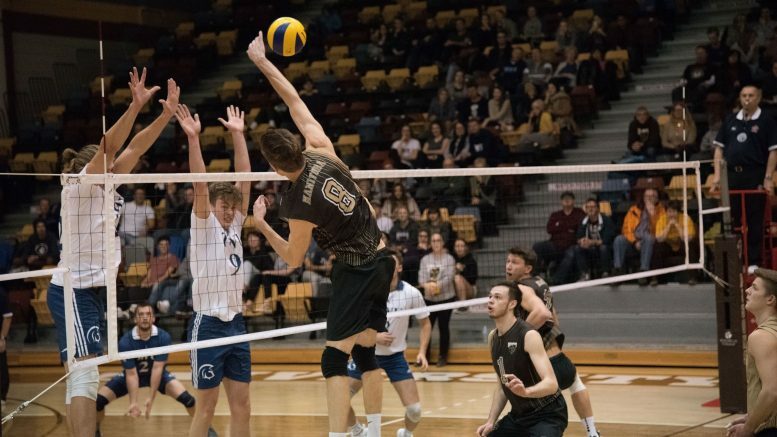 Manitoba fell into an early hole on Saturday, being down 2-0, but fought back to win the third set. The Spartans won the fourth set 25-20 to sweep the weekend series and extend their winning streak to 11. “I am really proud of the team, I really thought we played well and battled hard,” Pischke said. The Bison volleyball programs stay in Winnipeg next weekend for a home-and-home series against the University of Winnipeg. The 27th annual Duckworth Challenge commences on Jan.18.